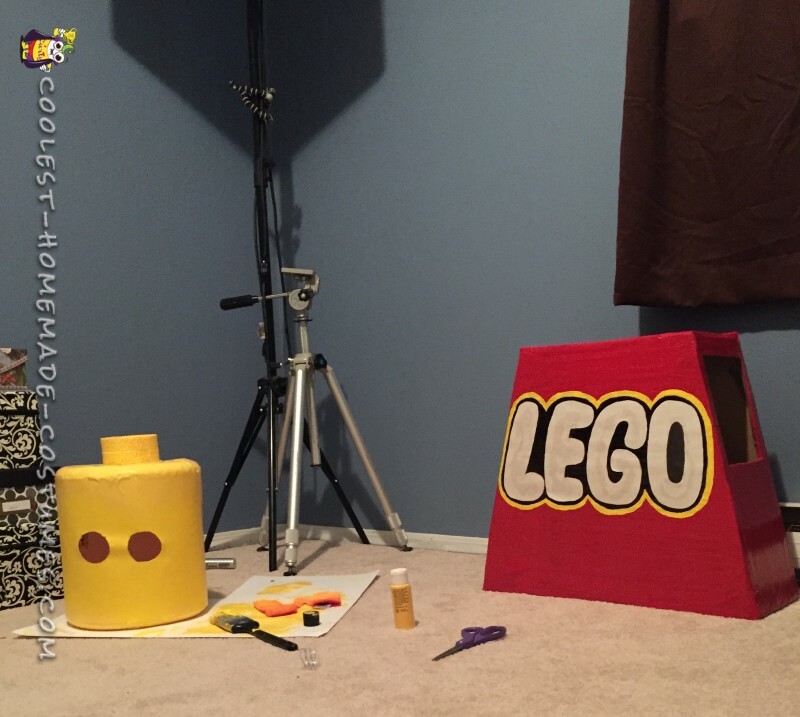 This little Lego Man costume for kids was very easy to make, and was finished in just a few days. I started by cutting a piece of cardboard into the shape of a typical Lego man. Square, but slightly wider at the bottom. I then measured the top to the bottom of the front price, and cut two rectangles that length to use as the sides of the body. Those pieces had small openings cut out to use as arm holes. I duct-taped the cardboard body together and painted it red. Any color or outfit a Lego character would wear would work. For the head, I bought two Styrofoam wreath circles, and wrapped a sturdy paper around the top and bottom of them. I cut out eyes and painted on a face with black paint. The little piece on top of the head was just more Styrofoam cut to shape and glued on with gorilla glue. I painted the head yellow and let it dry overnight. Once the body and the head were dry, they were both very sturdy. My son fell down once while running in his little Lego Man costume, and no damage was done! Perfect for active kids on Halloween! My son was able to run, jump around, spin, and have a great time on one of our favorite nights of the year. 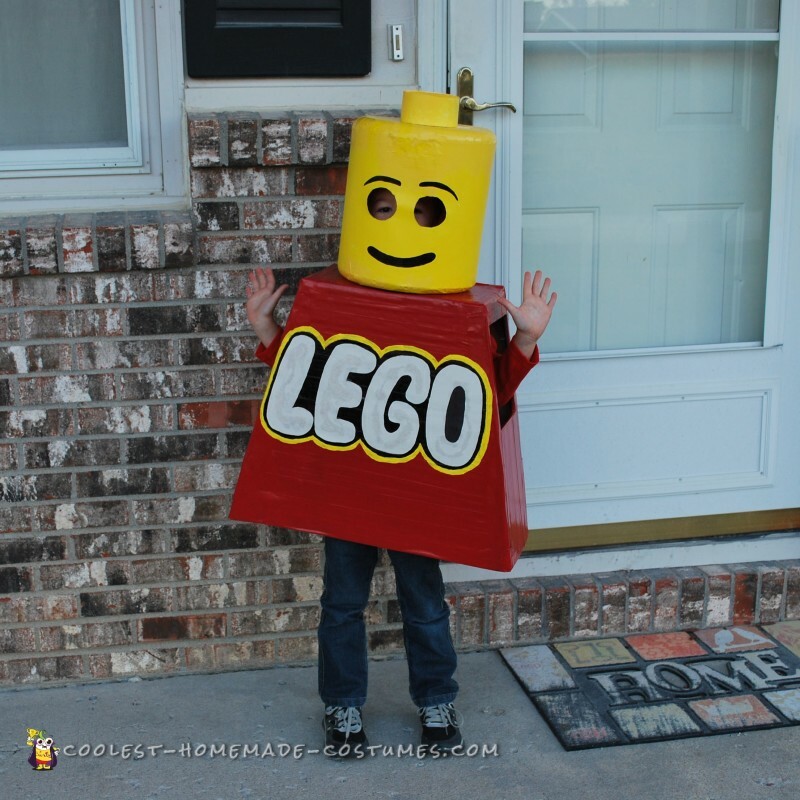 Almost every house we went to had someone who told my son his little Lego Man costume was the best costume they had seen all night. Several people even asked us if they could take a picture with him! He felt like a little celebrity all night with so many kids wanting to meet the Lego man. Many people were surprised to hear how easy the costume was to make. It is sturdy enough to use next year as well! It was so much fun to make and my 5 year old loved all the attention he got while trick or treating!